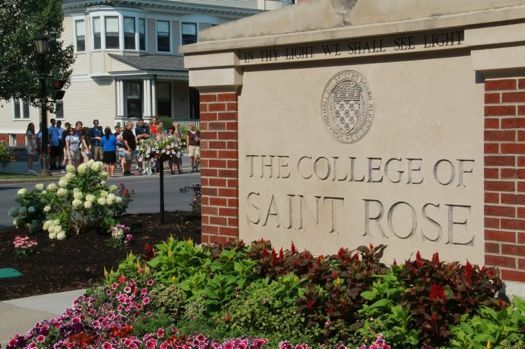 One of the main reasons The College of Saint Rose really appealed to me, outside of the community of course, was the immense amount of new opportunities that I knew that I HAD to take advantage of. I’m only a sophomore, but I have already participated in a lot and my decelerator is nonexistent at the moment. My name is Michael Aurrichio and like I said earlier, I’m a sophomore here at the College. I’m a childhood education major with a concentration in English, so it should come to no surprise that I enjoy writing. I have two different jobs on campus. One of my jobs on campus is as a tour guide. I do not feel the need to explain to you what a tour guide is. My other job title is “Online Ambassador”. This is something I constantly find myself explaining. Online ambassador is my work study position. I’ll work in either the Public Relations building or in Scanlan Hall, which is the undergraduate admissions building. I do various jobs within my title. I monitor the class of 2017 Facebook page. Last year, I had a vlog series called “The Fresh Perspective”, in which Lindsey Kopet and I talked about our experiences as freshmen here at the College. I also mess around with Google Analytics, which is an absolute blast! I’ve been an online ambassador almost as long as I’ve been here and I absolutely love it. I have had several opportunities to be in front of a camera as well as behind it. I almost came into college as a communications majors so I’m glad I’m still in touch with that side. I’ve actually been in several videos such as “You know you’re a Saint Rose Golden Knight…” and “Knight Light”. I might be in another video series soon so keep an eye out for that! Follow me on Twitter: @OA_Aurrichio!